When shopping for sterling silver jewellery it is firstly and most obviously important to find a design that appeals to your personal tastes. Doing this in an online jewellery shop may be harder than you think as it is easy to see a photograph and say “that is the piece I want” but what about the detail? Firstly you should be looking for an online jewellery shop that gives you multiple images of the jewellery you are looking at. You want to be able to see something such as a sterling silver pendant from all angles, especially the rear. Without good images of the jewellery you are shopping for, how do you know it is not merely a hollow backed pendant as opposed to a solid sterling silver one? In these images, also look for the “925” marking or Hallmark that denotes sterling silver. Although this could in theory be placed on any metal, a piece of jewellery stated as sterling silver will almost always have this hallmark proudly displayed on it. Next, you should look for the jewellery detail to be provided. 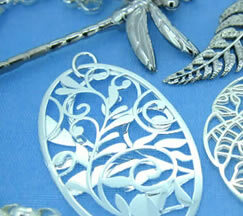 A good online jewellery shop will provide details such as the weight, length, width and depth. Pay attention to these as for example a sterling silver pendant weighing 2 grams is most likely not solid sterling silver and more likely a hollow one whereas a pendant weighing 5 grams would in fact be solid. 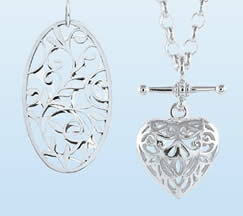 At The Jewellery Shop we also believe that items such as pendants should come with a sterling silver chain included. What good is a pendant if you can’t wear it when you receive it? So when browsing your online jewellery store, be sure to note whether the description says “chain included” and try to know what size necklace you like to wear too. For more jewellery shopping tips, visit our Jewellery Guides.